Mathematics Research Center Symposium: Waves on Fluid Interfaces covers the proceedings of a symposium conducted by the Mathematics Research Center of the University of Wisconsin-Madison on October 18-20, 1982. 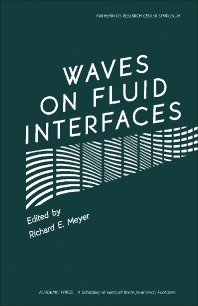 The book focuses on nonlinear instabilities of classical interfaces, physical structure of real interfaces, and the challenges these reactions pose to the understanding of fluids. The selection first elaborates on finite-amplitude interfacial waves, instability of finite-amplitude interfacial waves, and finite-amplitude water waves with surface tension. Discussions focus on reformulation as an integro-differential equation, perturbation solutions, results for interfacial waves with current jump, wave of zero height, weakly nonlinear waves, and numerical methods. The text then takes a look at generalized vortex methods for free-surface flows; a review of solution methods for viscous flow in the presence of deformable boundaries; and existence criteria for fluid interfaces in the absence of gravity. The book ponders on the endothelial interface between tissue and blood, moving contact line, rupture of thin liquid films, film waves, and interfacial instabilities caused by air flow over a thin liquid layer. Topics include stability analysis of liquid film, interpretation of film instabilities, simple film, linear stability theory, inadequacy of the usual hydrodynamic model, and marcomolecule transport across the artery wall. The selection is a valuable source of data for researchers interested in the reactions of waves on fluid interfaces.